What should have been a very encouraging double digit win at Fenway Park in the Red Sox 2012 home opener was marred by the injury to arguably the best player on the roster, Jacoby Ellsbury, in the fourth inning of this afternoon’s ballgame at Fenway Park. Backed by a fantastic outing by Josh Beckett (8 innings, 5 hits allowed, 1 walk, 1 K, 1 earned run) the hometown Sox defeated the Tampa Bay Rays 12-2 to improve to 2-5 on the young season. Unfortunately the biggest news of the day is that the runner up in last year’s American League Most Valuable Player race, Ellsbury, left the game in the fourth inning after a collision with Rays shortstop Reid Brignac on a double-play ball off the bat of Sox second baseman Dustin Pedroia. Moments after Ellsbury hit an RBI single to right to give Beckett a 4-1 lead, he took a rough slide into second base trying to break up a double play on a hit-and-run off Pedroia’s bat and both Ellsbury and Brignac came up hobbling. Sadly, for the Red Sox, Ellsbury was too injured to continue the game and was taken to Massachusetts General Hospital for further testing. I am not a doctor and do not want to speculate on how bad Jacoby’s injury could be, but from all accounts it sounds like he is headed back to the disabled list. Red Sox manager Bobby Valentine, who was still awaiting word about the extent of the injury to Ellsbury’s shoulder said that the team would call up an outfielder for Saturday’s game. That man appears to be defensive centerfielder Che-Hsuan Lin who was scratched from the Pawtucket Red Sox lineup less than two minutes before first-pitch today. Lin is the only healthy outfielder on the Red Sox 40-man roster that is not already in Boston, and it is being reported that he is on his way to the big club as I write this. Lin will likely serve as the Red Sox fourth outfielder while Ryan Sweeney, Cody Ross and Darnell McDonald man the outfield until Jacoby Ellsbury and 4-time all-star Carl Crawford (who is dealing with his own elbow injury and reportedly had another setback today) are healthy enough to come back to play. Che-Hsuan Lin has some big shoes to fill if Ellbury will be out for any extended period of time. This is yet another blow to the Red Sox 2012 hopes and some tough news for a club that is already struggling to regain the trust and admiration of a fan base that still remains upset about the chicken and beer antics and the historic collapse of last September. Injuries are the one part of the game that nobody wants to see, and that management can’t predict, but for fans the frustration cannot get much higher. Hopefully for the Red Sox these average at best players will be able to hold down the fort and provide some production while Ellsbury and Crawford are out. 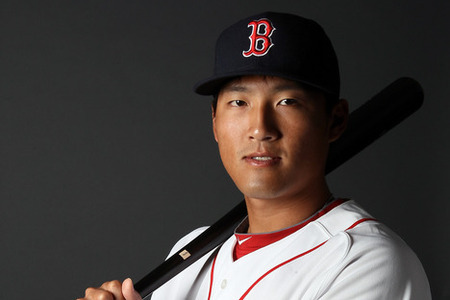 And who knows, maybe Linsanity can extend beyond New York and be revived by the Red Sox version Che-Hsuan Lin. This entry was posted in MLB and tagged Che-Hsuan Lin, Jacoby Ellsbury, Linsanity, MLB, Red Sox. Bookmark the permalink. Just when you thought the linsanity was behind us.. No offense to Lin, but let’s hope Ellsbury isn’t out for long! Well the Lin era didn’t last long in Boston (only one game), but you are certainly right…the Sox need Ellsbury healthy ASAP! He is quickly becoming my favorite player on the team and I just hope that he’s not too injury prone for his own good. That is awesome that you have a friend with those kind of connections and that you’ve got to enjoy the minor league experience as well. I got my first (and only) foul ball at McCoy Stadium in Pawtucket when I was a little kid, so that place and team always will have a special place in my heart. In regards to Lin, he simply is not ready to play at the major league level. He is only 23 years old and still needs more experience playing baseball in the United States, but he was the only healthy outfielder on the Red Sox 40 man roster who was available to bring up without making more complicated roster moves. After the game yesterday afternoon the team made a few moves, and brought up Jason Repko to play centerfield while Jacoby and Crawford recover, so Lin was just a temporary replacement. He still is one of the top prospects in the Sox organization so we may see him down the road. Jacoby is expected to miss at least 6 weeks. There is currently no timetable for his return, and the official diagnoses of his injury is a subluxation of his right shoulder (which I’m sure your friend understands way better than I ever could). Hopefully this is something that will heal on its own and with the help of ice packs, anti-inflammatory meds, and extensive rehab, because if he needs surgery he may be out a while. And thanks again for your interest in my blog. I’m actually writing up my first report on the Sox season so far, and hoping to put out a weekly entry about the team in the future, so keep checking back for the news! Glad to have any Sox fans following me! I follow every post! Subluxation is just a dislocation – not even a full dislocation.. I’ve subluxated my shoulder a few times. Of course, I just played college softball so it wasn’t a big deal. He won’t need surgery (if he does it’s because he tore something during subluxation – but if so they probably would have announced that too. Any time a joint comes out, it tears the labrum, and if you’re not careful (rehab), it can continue to repeat the problem. Keep it up.. I will be reading! That is excellent news about Ellsbury probably not needing surgery then, the word “sublaxation” scared me as I haven’t taken an anatomy class in over 5 years and it doesn’t sound like a pleasant word. Didn’t know you had a MS in Exercise Science either, I have one in sport management/administration. And I have been following your blog, ever since I found out we had the same birthday and “National Run with Katy Day”. I actually think about your journey every time I lace my sneakers up when I’d rather be doing something else. Gotta get that mileage up if I want to run a half-marathon or go through with the full experience, and your blog does provide me some of that motivation. I used to be a sprinter so running these distances are new to me, but it is keeping me in better shape and helps a bit in balancing out the rest of life.